To the average shopper, Neighborhood Goods will likely feel like your good ol’ department store. The store — which opened November 17 in Plano, Texas’s Legacy West shopping district — is stocking labels shoppers know, and possibly even love, in a central location. It sells clothing, skin care products, home goods, gadgets, and more. It has a sneaker museum, where shoppers can learn about the history of “drops” and presumably get some great shots for Instagram — exactly the kind of experience that malls are trying to give shoppers more and more these days. But your local Macy’s doesn’t sell direct-to-consumer brands like Hims and MeUndies, and it almost certainly doesn’t have advanced cameras that track shoppers’ movements and an app that will send you targeted recommendations based on items you browsed but didn’t buy. And, behind the scenes, the business model — which allows startups to rent space in the store, the way office workers can in a WeWork or vacationers do via Airbnb — could potentially disrupt brick and mortar retail as we know it. Neighborhood Goods is one of two new retail initiatives that is bringing the principles of the sharing economy to the mall. The other, Re:store, opens in February in San Francisco and is even being marketed as “the WeWork of retail” by its founder, Selene Cruz. The fundamentals of these multi-billion dollar disruptors — how sharing can lower costs and limitations — is exactly what retail needs, says Neighbor Goods co-founder and CEO Matt Alexander. Take Soho, one of New York’s top shopping destinations, where rising rents have turned the neighborhood into a ghost town. Madison Avenue, another top shopping destination in New York, has rows of empty storefronts too, as do formerly retail-heavy neighborhoods in the Bay Area and Los Angeles. Neighborhood Goods has corners of experiential retail throughout its store. The proposition of joining a space like Neighborhood Goods or Re:store makes sense for new companies. Re:store’s Cruz can relate. She had previously started a handbag company, Archer Brighton, and her experience didn’t just show her how impossible it is for small companies to expand into stores — it showed her how retail was a Catch-22. While having a real-life outlet is necessary for growth, it’s impossible if you don’t have enough product or funds. Re:store will launch its first location selling products from about 60 smaller brands that have only been available on Shopify or Instagram up until now. Cruz adds that many of the small Instagram brands she’s speaking with are sick of relying on social media to boost their brands. 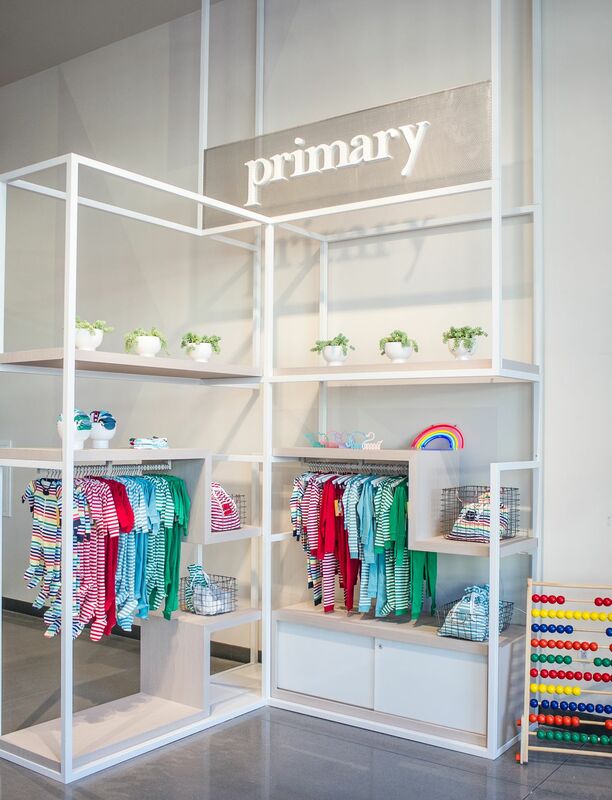 Kids clothing brand Primary’s first retail presence is inside Neighborhood Goods. The power of discovery — without direct competition — is a huge potential benefit of brick and mortar. Before launch, Neighborhood Goods raised $5.8 million in funding from VC firms like Forerunner Ventures and Maveron, which are frequent investors in digital, direct-to-consumer brands. This means the company will have unlimited access to the latest direct to consumer brands that don’t sell to other stores. So far, luggage brand Away and sneaker company Allbirds are brands the company is looking into bringing to the store later next year. The star power of known brands like these stands to bring greater attention to the smaller brands already sharing the space. Neighborhood Goods’ array of products will also include lingerie from MeUndies, clothes from Reese Witherspoon’s Draper James, men’s grooming products from Hims, rare sneakers from the marketplace Stadium Goods, children’s apparel from Primary, and bedding from Allswell. Similarly, Re:store will offer three types of membership: $350 a month will get brands a space inside the store, $550 will get them both retail and co-working space, and $850 will cover retail and co-working space, as well as inventory and stocking services. In exchange, Re:store will take a 20 percent commission of sales. 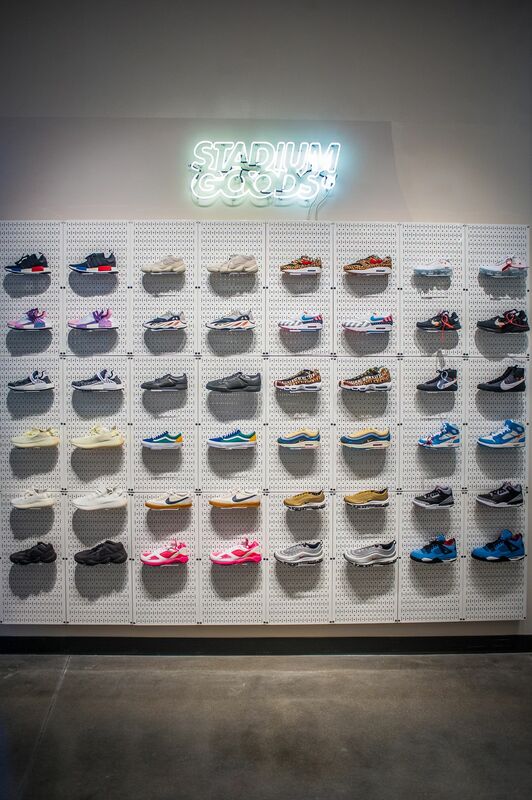 Sneaker marketplace Stadium Goods has a museum about the “drop” inside. For example, the store will have a dedicated app that, with the help of 30 security cameras dotting the space, will track shoppers and provide personalized notifications. If a camera sees a shopper pick up a Draper James bag but decline to buy it, the app could send them a push notification a few days later, offering 10 percent off. Stores have been using beacons and facial recognition technology for years, but there’s something eerie about a store boasting these type of surveillance capabilities as a draw. Alexander admits Neighborhood Goods is currently tiptoeing a delicate line between innovative and creepy, and maintains it will be slow to roll out the full capabilities of its surveillance system, if at all. The store has screens all across the space; they can track a shopper as they walk by and display ads from the brands they browsed. It’s like those Facebook targeting ads.